Flashpoint Introduces Four LED On-Camera Lights to Lineup -- On Sale Now! NEW YORK, NY--(Marketwired - Apr 22, 2015) - Flashpoint (http://www.adorama.com/brands/flashpoint), a leading manufacturer of professional photography and video equipment, is bringing the power of LED lighting to DSLR cameras with four new on-camera lighting units: the Flashpoint 300 LED (on-camera light with audio) (http://www.adorama.com/FPLCL300.html); the Flashpoint 198 LED (bi-color on-camera light) (http://www.adorama.com/FPLCL198B.html); the Flashpoint 198 LED (VariAngle on-camera light) (http://www.adorama.com/FPLCL198.html); and the Flashpoint Reporter Super Compact 150 LED (on-camera light) (http://www.adorama.com/FPLCL150.html). Light enough to go anywhere with enough light to go everywhere, the newest additions to the Flashpoint family are now available at discounted prices online at Adorama's official website and at the Adorama superstore, located at 42 West 18th Street in New York City. 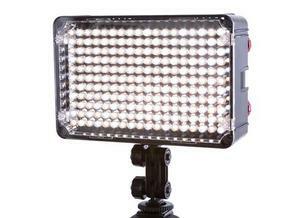 The large 300 diode LED gives action videographers and still photographers super bright, high-quality output. With auto light levels, stereo microphones and a signal flash mode, the 300 LED can sense lighting requirements and delivers automatic balance exposure as it passes from one environment to another, making it ideal for run-and-gun shooters looking for the most light on demand. The on-board stereo electret condenser microphones are also invaluable for traveling shooters, minimizing the need to cage-rig a camera for attaching an external microphone. The sensitive mics are distanced from camera sounds on either top corner of the light, delivering clean audio directly to the camera. All fitting comfortably atop a camera's hot shoe or off-camera via the convenient stand thread, the 300 LED is a comprehensive package in a superior, sleek design. The 198 LED Bi-Color has the extraordinary ability to dial in exact color temperature to match or compete with its surroundings. The precision color temperature dial easily adjusts between 3200 and 5600K to provide quick solutions for shooters on the go, meeting every ambient environmental challenge possible. It provides visually accurate color temperatures and flicker-free output with no color shift when dimming. When used outdoors, the small, self-contained LED light produces enough light to alleviate deep shadows while blending available light to add modeling to subjects. Super lightweight, the 198 LED Bi-Color fits comfortably on DSLR hot shoes and off-camera via the convenient stand thread. Compatible with just about any capacity industry standard Sony or Panasonic lithium battery cells as well as universally available AA batteries, the 198 LED Bi-Color gives support where and when it is needed the most. The 198 LED VariAngle gives users the ability to focus light for a more precise spread. With a brilliant variable angle beam from a 25-degree spot to a standard 60-degree spread, it offers more versatile power than a normal LED. The unique variable light can deliver illumination beyond the 16 inches achieved with a 60-degree spread because of its light concentration of up to 4470 lumens at 25 degrees. Two additional interchangeable color panels give users instantaneous control between 3200 and 5600K for immediate results. Like its other Flashpoint counterparts, the 198 LED VariAngle is perfect for mobile and location photographers due to its lightweight frame and numerous power options including compatibility with almost any capacity industry standard Sony type lithium battery and universally available AA battery. 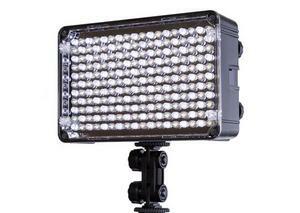 Super compact and sleek, the Reporter Super Compact 150 LED is a favorite for short photo and video clip needs and interviews. It is designed to be as portable and mobile as a cellphone and even uses a cellphone charger. Ideal for reporters, bloggers, run-and-gun shooters, foodies, and users in need of a backup or emergency light, the Reporter Super Compact 150 LED is perfect for shots on any DSLR or HD camcorder with its 900-lux output. The included removable hotshoe mount with threads makes it easy to use on camera, on a stand or flex-pod, or even handheld. It incorporates a generous 60-degree spread and the added benefit of a pocketsize Smartphone footprint with a self-contained rechargeable battery to create a modern day solution for anyone looking to capture the latest story. All new Flashpoint LED models are available at steeply discounted prices. 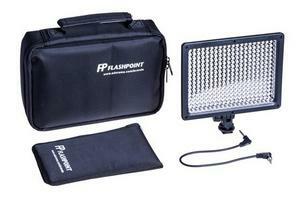 The Flashpoint 300 LED (on-camera light with audio) is now available for just 79.95 USD (20% off). The Flashpoint 198 LED (bi-color on-camera light) is available for 79.99 USD (20% off). 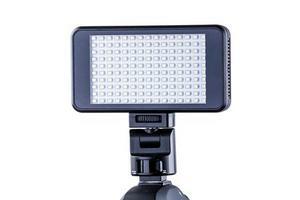 The Flashpoint 198 LED (VariAngle on-camera light) is available for 89.95 USD (40% off). The Flashpoint Reporter Super Compact 150 LED (on-camera light) is available for 49.95 USD (29% off). For more information on Flashpoint's available LED models, or to see the entire Flashpoint lineup, please visit http://www.adorama.com/brands/flashpoint. Used by industry professionals who want superior results, Flashpoint produces the highest quality pro lighting and video equipment our market has to offer while maintaining true value, to help our partner photographers in today's competitive market. Flashpoint's most popular products include traditional and wireless/portable strobes and monolights, reflectors, flash modifiers, softboxes, light stands, on-camera video lighting, power packs, and camera and lighting accessories. Flashpoint's Power Station (http://www.adorama.com/FPPPPS800.html) was recognized by Professional Photographer magazine with a 2014 Hot Ones Award. Available exclusively at Adorama, customers can visit the Flashpoint brand store online to shop: http://www.adorama.com/brands/flashpoint, or visit the Adorama Learning Center to learn more about Flashpoint products: http://www.adorama.com/alc/search/node/flashpoint. Adorama is more than a camera store -- it's one of the world's largest photography, video, imaging and electronics retailers. Serving customers for more than 35 years, Adorama's vast product offerings encompass home entertainment, mobile computing, and professional video and audio, while its services include an in-house photo lab, AdoramaPix, pro equipment rental at Adorama Rental Company, and the award-winning Adorama Learning Center and AdoramaTV. Adorama is listed as one of the top five electronics retailers by Consumer Reports, "Best of the Web" by Forbes.com, Internet Retailers Top 100, and is the official Electronics Retailer of the NY Giants. Visit Adorama at www.adorama.com.